The Greater Tunnel Snail is often spotted trundling across sand schools. Congratulations to the first winners of the first heat of the Agria Agility Challenge 2019 which was held at Andoversford Point to Point Festival. All the 2019 Agria Agility Challenge heats can now be found on the Agilitynet Show Diary by using the Qualifiers filter button. The sun shone over the winners of the first heat of the nimal Health Co Classic at Scunthorpe. Kerry Rhodes started her agility journey with two Rhodesian Ridgebacks dogs and is now half way to G6. Ring plan and show information for the Next Crooked Oak show is now available on the Show Diary. Both Otley and Ribble have extended their closing dates. Venue and equipment hire available at Jerry Green Dog Rescue Centres in N. Yorks, Notts and S. Lincs for individuals, clubs and shows. Barjo tailgate guard needed for Toyota RAV4 ‘63 plate. The Whizz Dogs show has had a change of venue and consequently the closing date has been extended to the 23rd. Following the announcement by the KC last week regarding the changes in the Olympia qualifying competitions, Gillingham DTS has amended their show show schedule. Revised Agillidogz schedules now available. Weaves that Wow, a book by Amanda Shyne, wanted. 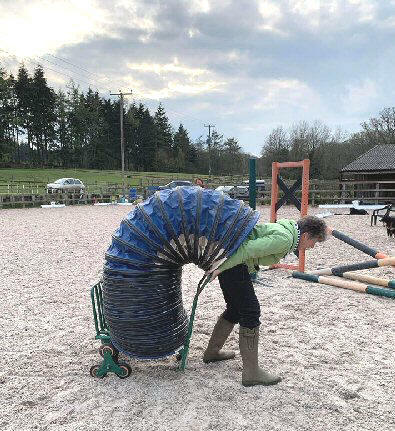 The Great Tunnel Snail is often spotted in all weather, trundling across sandschools across the UK. If Echo doesn't find a home by 1st June, he will have to go back to Ireland. Maxine Craig has decided to stop judging for good. Due to work commitments Phase Purple has a change of Show Managers for their Easter show. The 21st July Pachesham 123 Beginners show has been cancelled. Agilitynet FB is at 26.4k members of which 20.7k of them are actively engaged in the Group. How the IMCA Team selection process has been effected by Brexit. We couldn't do Agilitynet without you! If you have any ideas for the site, we'd love to hear from you. Email Ellen at Agilitynet with your news, stories, and photos etc. to read some of the articles and features that you may have missed the first time round. If you find a broken link, please please let us know. Don't be shy. We won't take offence. We can't fix the problem if we don't know it's there. Just tell where you've had the problem on an email with the name of the page on it.